Somalia, on the eastern coast of Africa between the Gulf of Aden and the Indian Ocean, is one of the poorest countries in the world, with a predominantly nomadic population, few natural resources and a drought-prone climate. In 1977, war against Ethiopia increased economic and social problems, followed in 1991 by the outbreak of civil war. The situation is still unstable, particularly in the capital Mogadishu where looting and outbreaks of violence between rival warmongering clans are common. The deteriorating health of the population is a cause for major concern, as there are still very few clinics and hospitals. Malaria, TB and eye diseases are widespread as is malnutrition, particularly after the frequent droughts. 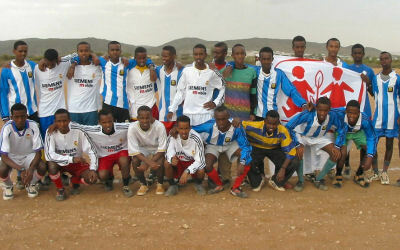 The charity's work here began in 1985 when the charity built a community on the outskirts of Mogadishu. It has twelve family houses that are home to 120 children and a youth house. There is a kindergarten and a school (primary and secondary) attended by 450 pupils. This is an important educational facility not only for the SOS children but also for those from the neighbourhood. With even basic medical facilities almost non-existent in Mogadishu, a mother and child clinic and paediatric hospital were also established. Both make a significant contribution to health care in Somalia. According to the World Health Organisation, mortality rates relating to infants, children under five and mothers are nearly three times the global rates. On an average day 120 women receive pre- and ante-natal care, fourteen births are handled and two major operations performed. To date, it is still the only functioning maternity ward and gynaecological care facility in Somalia. The SOS paediatric hospital has 140 beds for children up to fifteen years, and deals with 250 outpatient cases daily. As well as medical treatment, it provides supplementary dry food to families of children suffering from malnutrition. Following the outbreak of the civil war in 1991, SOS Children began an on-going emergency relief programme in Somalia. This has included feeding and vaccination programmes and medical treatment as well as a temporary camp for orphaned children and an emergency hospital, often operating under shellfire. 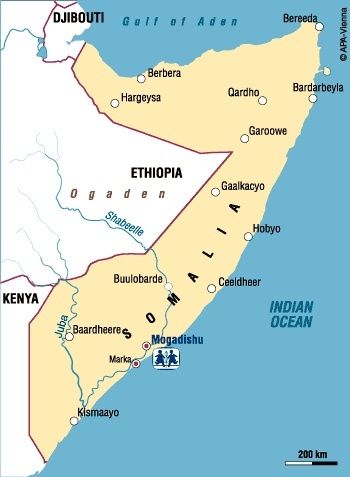 The latest SOS project is in northern Somalia, in the former British colony of Somaliland which became independent in 1991 (but has not yet been internationally recognised). The political situation here is now relatively stable, and reconstruction of the infrastructure is taking place. A former secondary school in Sheikh, acclaimed during the 1950s as one of the best schools in the country, has been renovated and made operational again, with over 240 pupils studying for GCSE and International Baccalaureate since January 2003.